The foundation stone was laid in 1882. The architects were H E Coe and Robinson (B 43 p258), though the responsible partner at this time was S R J Smith (RIBAJ 20 (1918) p412). He used brick inside and out, even for the heads of the arcades and the tall, shafted chancel arch, and the only decoration is a painted text around the latter arch. There are variously grouped lancets, including three stepped east ones and five to the west, enclosed in an arch. The open and fairly short chancel indicates the evangelical sympathies of the parish. The church was opened without a tower, as this was to be added at the west end of the north aisle when funds permitted (B 43 ibid), which proved to be in 1888 (VCH 6(1) p121). It has an octagonal belfry stage with heavy pinnacles in the angles, large louvred openings and a tall shingled spire. It has been assumed that the tower was part of the original design, but the obituary of R S Hyde (Arch J 38 p344) names him as the architect. There are other instances where this obituary credits Hyde with a design generally ascribed to another (cf St Botolph, Heene), but even if Smith’s design was kept, it is possible that Hyde as a local architect oversaw the work and perhaps made changes. If so, he may also have designed the polygonal vestry north of the chancel, which is said to date from 1894 (Elleray plate 203) and is one of the most striking features of the exterior. The interior was little changed until a remodelling in 1978 by K C Murrin (Elleray (2004) p57). This partitioned off the west end of nave and aisles to create a lobby or narthex and storage space. 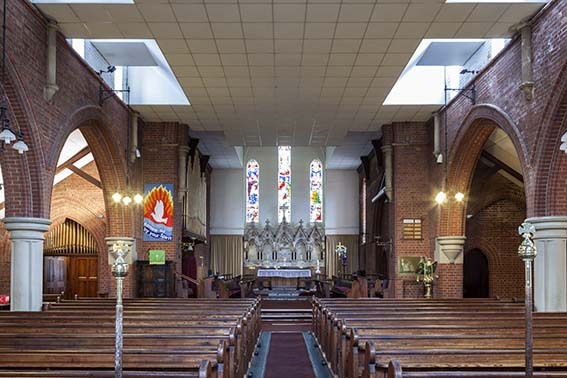 The most regrettable feature is a flat suspended ceiling just above the arcades that hides the roofs completely; as well as cutting off the top of the chancel arch, it necessitates the placing of the tops of the east lancets and clerestory in a kind of boxed surround. 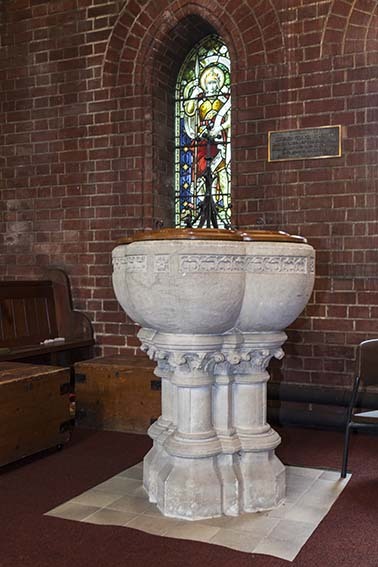 The intention is said to have been to conserve heat but it seems a rather excessive means of achieving this and according to later press reports the parish was hoping to remove it, as well as undertaking necessary repairs. 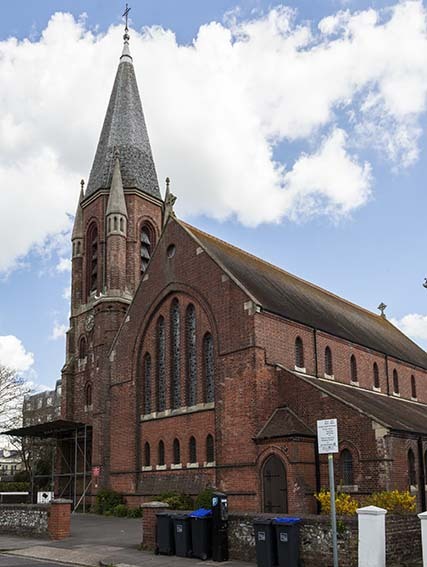 However, this is now unlikely since the parish was merged with that of Christ Church in 2011 and three years later the church ceased to be used. 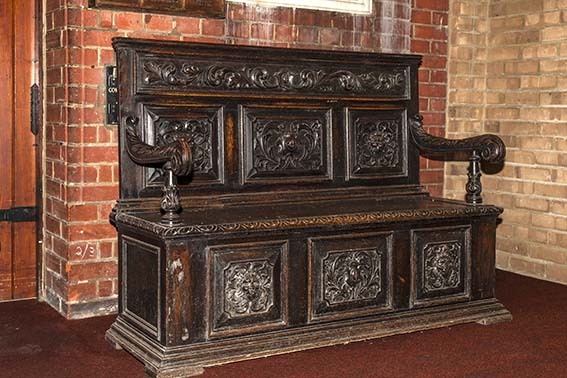 Bench: (West narthex) Substantial C17 with a back and arms, and carved panels. Its origin is not known. Font: Bowl of quatrefoil section, resting on a stem composed of clustered shafts with foliage capitals. 1. 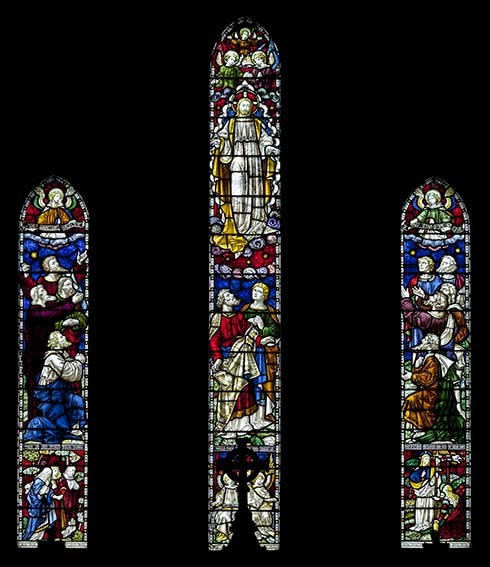 (South aisle, second and seventh windows; north aisle, second, fourth and sixth windows and lower west windows) Clayton and Bell, 1891-1928 (www.stainedglassrecords.org retrieved on 29/3/2013). 2. 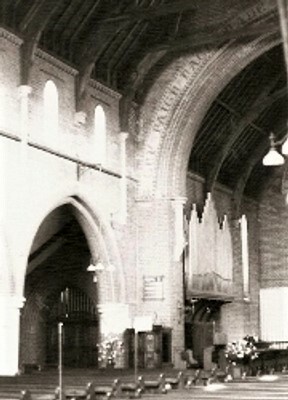 (North aisle) Morris and Co, 1933 (Sewter p209). A late example of the company’s work. its authorship is shown primarily by the drawing of the trees in the background. 3. 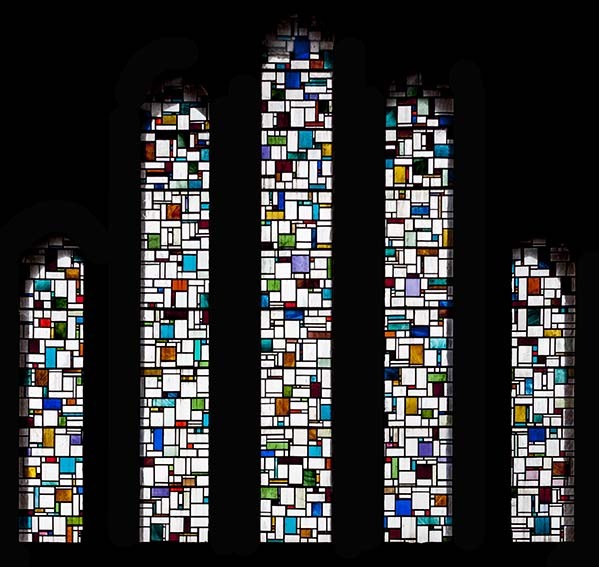 (Upper west windows) Modern abstract in squares. The designer is not recorded. 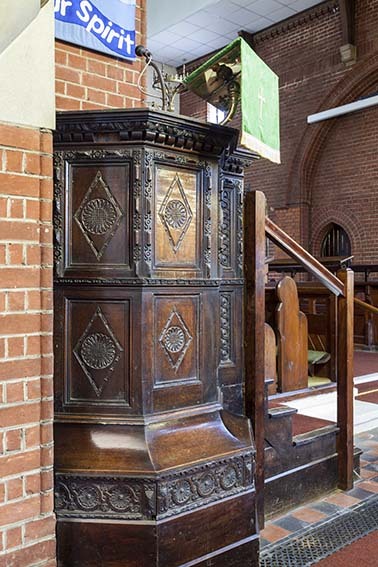 Pulpit: Early C17, brought here from Broadwater church (VCH ibid). It lacks its tester and is polygonal with shallow carving in the sides. Reredos: Arcaded alabaster with marble shafts and of some consequence. It must date from around the building of the church its and bears religious texts rather than the figures usual by this date. It thus testifies to the evangelical sympathies of the parish and of the town as a whole. My thanks to Nick Wiseman for all the colour photographs.